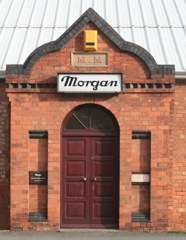 Morgan is based in Malvern Link, an area of Malvern, Worcestershire and employs 177 people. Morgan has stated that they produce "in excess of 1300" cars per year, all assembled by hand. The waiting list for a car is approximately six months, although it has been as long as ten years in the past. Peter Morgan, son of HFS, ran the company until a few years before his death in 2003. He was replaced as chairman by Alan Garnett, a non-family director, from 2003 to 2006. After Mr. Garnett's resignation, a four-man management team was set up. Charles Morgan, son of Peter, Matthew Parkin, Tim Whitworth, Steve Morris made up the new management team, and in 2010, after Mr. Parkin's resignation, Charles Morgan was named Managing Director. However, in January 2013, Charles Morgan was removed as Managing Director, replaced by Steve Morris. He continued as strategy director until October 2013 when he was removed both as an employee, and from the Board of Directors. At the end of 2013, the shareholders appointed Andrew Duncan, a local solicitor, as the Chairman. In 2016, he resigned as Chairman and company director and was replaced as Chairman by a new director by Dominic Riley, a business turnaround expert. The Morgan Plus E was an experimental electric version of a classical Morgan, a joint project of Morgan with Zytek and Radshape (Radshape Sheet Metal Ltd.), funded by the UK government. It was displayed at the 2012 Geneva Motor Show. For part of the 1950s and 1960s, the USA provided the company with its largest market worldwide, taking up to 85% of all production. This ended with the first wave of US safety and emission regulations in 1971. 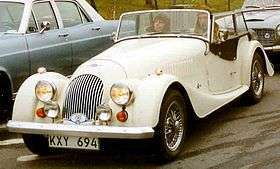 For many years (1974 to 1992), all Morgans imported into the United States were converted to run on propane as fuel to pass the U.S. emissions regulations. However, this conversion, along with bringing the cars into compliance with U.S. vehicle safety legislation, was carried out by the dealership, and not by the factory, making the cars grey market vehicles. 1 2 Hastings, Harold (30 May 1970). "Sixty years old and thriving". 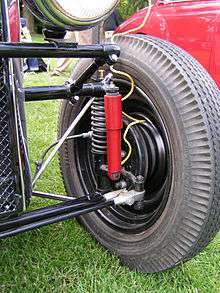 Motor: 28–31. ↑ Ping Chan, Szu (18 October 2013). "Charles Morgan describes distress at being ousted from board role". Daily Telegraph. London. Retrieved November 12, 2013. ↑ "Charles Morgan removed from world-famous UK car firm". BBC. 31 October 2013. Retrieved November 12, 2013. ↑ Massy, Ray (17 October 2013). "Historic British sports car maker Morgan faces backlash after ousting the founder's final family member from the board". Daily Mail. London. Retrieved November 12, 2013. ↑ "How The Morgan Began". 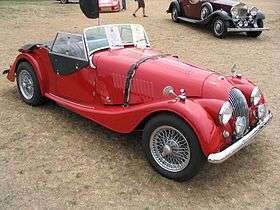 Morgan3w.de. 1952-07-29. Archived from the original on 2012-03-02. Retrieved 2011-09-17. 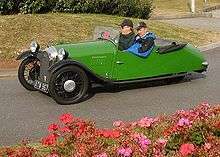 1 2 3 "The Morgan Three-wheeler Models". Morgan3w.de. Archived from the original on 2012-12-03. Retrieved 2011-09-17. 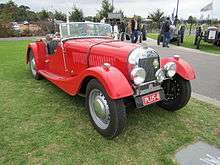 ↑ "Engines used in the Morgan Three-wheeler". Morgan3w.de. Archived from the original on 2012-04-08. Retrieved 2011-09-17. 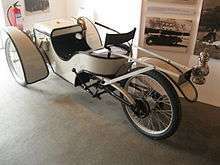 1 2 "– Technical Details of the Morgan Three-wheelers". Morgan3w.de. Archived from the original on 2012-07-10. Retrieved 2011-09-17. 1 2 3 Hill, Ken (2007) . "Morgan cars". The Morgan. Shire Series. 327. Princes Risborough, Buckinghamshire, UK: Shire Publications. pp. 13–14. ISBN 978-0-7478-0328-7. Retrieved 2013-02-13. 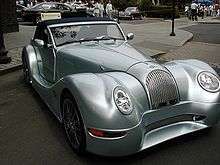 ↑ "2006 Morgan Aeromax". Seriouswheels.com. Retrieved 2011-09-17. 1 2 3 4 5 6 "2011 Morgan Threewheeler". Edmunds Inside Line. Edmunds Inc. Nov 4, 2010. Retrieved 2011-02-19. 1 2 3 4 5 Harrison, Sarah-Jayne (3 November 2010). 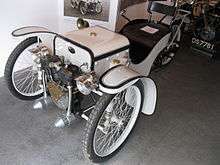 "Morgan 3 Wheeler (2011) first official pictures". Car Magazine. Peterborough, Cambridgeshire, UK: Bauer Media. Retrieved 2011-02-19. 1 2 3 4 5 6 Phillips, Tom (4 November 2010). "Morgan revives the Threewheeler". Auto Express. London: Dennis Publishing. Retrieved 2011-02-19. 1 2 3 4 5 Constant, Brad (2010-03-11). "Morgan Threewheeler returns after 58-year break". Autoweek. Detroit, MI, USA: Crain Communications. Retrieved 2011-02-19. 1 2 3 4 5 6 Miersma, Seyth (November 3, 2010). "First Look: 2011 Morgan Threewheeler". Winding Road. Ypsilanti, MI, USA. Retrieved 2011-02-19. ↑ Garrett, Jerry (2011-02-25). "Geneva Auto Show: Morgan 3 Wheeler". The New York Times. Retrieved 2011-03-04. It was announced to have an 81-horsepower V-twin motorcycle engine built by S & S, the same company that builds motors for so-called Harley clone choppers, and is closely based on late-model Harley-Davidson power plants. However, the UK test the final bhp at 81 bhp. ↑ Berkowitz, Justin (March 2011). "Morgan 3-Wheeler - Auto Shows". Car and Driver. Hachette Filipacchi Media U.S. Retrieved 2011-03-04. This S&S-supplied powerplant is a bit more modern, though: It produces 81 hp, is fuel-injected, and is mated to a Mazda-sourced five-speed gearbox. ↑ "Reprint of Car & Driver article, January 1977". Morgancars-usa.com. Retrieved 2011-09-17. ↑ Hardiman, Paul. "The New Morgan Three Wheeler". Hagerty.com. Retrieved 2014-03-01. ↑ "British Sportscar Maker Morgan to Race LMP2 Car at Le Mans". motortrend.com. 2012-01-23. Retrieved 2012-03-04. ↑ "How the troubleshooter's firms fared". BBC. January 11, 2008. Retrieved 2011-10-13.